Poll Bludger: is One Nation going to take over the Qld govt? Several interesting political developments have converged on Queensland to create the perfect storm ahead of the next state election. Labor's candidate, Pat O'Neill hung up his army gear for the first time in 18 years on Thursday, and donned a suit to mark his first week campaigning. The President of the United States sure knows how to put on a show. Freelance journalist James Rose is suitably impressed by the Magic of Obama. Freelance journalist James Rose talks to the protesters of the G20 -- whose voices of dissent were mostly ignored by the media in favour of President Obama cuddling a koala. Crikey Clarifier: what is the G20 and why should we care? This year's G20 summit in Brisbane is fast approaching, with meetings occurring throughout Australia in the lead-up to the big event. Crikey intern Toli Papadopoulos finds out what all the fuss is about. The good people of Griffith aren't very excited about Saturday's byelection to replace Kevin Rudd -- if they know about it at all. James Rose walked the heat-hazed streets to take the pulse. 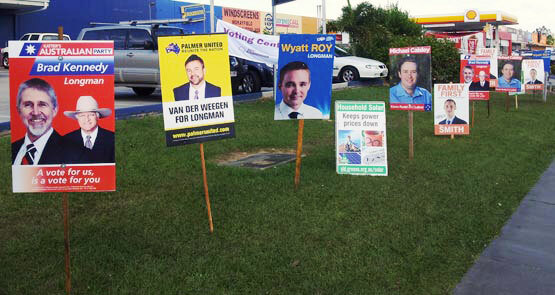 Freelance journalist James Rose visits the Queensland seat of Longman and finds that whether pint-sized MP Wyatt Roy holds on or not, victory might not be all it's cracked up to be.